Marycris Oplas visited BKR Australia last February 15, 2016. 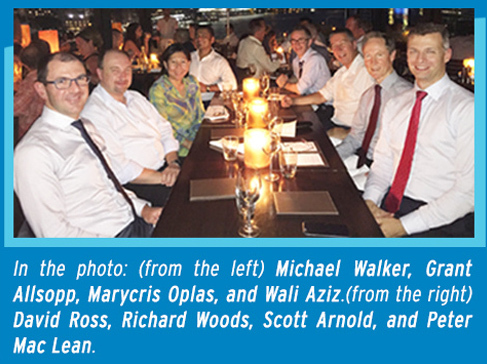 She had a dinner meeting with Michael Walker, Grant Allsopp, Wali Aziz, David Ross, Richard Woods, Scott Arnold, and Peter Mac Lean of Walker Wayland Partners at Café Sydney. “It was a hectic meeting [but very] fruitful,” Oplas shared during the interview that she had meet up with a lot of firms and prospective clients as well, to strengthen their relationship, all in one day, and one of them is the Walker Wayland Partners. Walker Wayland Partners or Walker Wayland NSW is one of the leading accountancy and business ﬁrms in Australasia. An Independent Member of BKR International, the ﬁrm has 11 head ofﬁces all over Australia, and has been providing accounting, auditing and assurance services for 30 years. “I also met prospective clients there who would be doing the [outsourcing] here. They will just bring their work in Manila also for SMSF,” Oplas gleefully stated. Self-Managed Super Annulation Fund or simply known as SMSF is a retirement fund for Australians. They are required by the Australian government to chip in a certain amount based on their salary. “Now, once you have that fund, you can have it managed by other funders, or you can self-manage it. But all [of] these funds [needed] to be audited by the government, [needed] to be ﬁled, and it must be audited by external auditors.” Oplas concluded.